Since 2012, when the Apple Retina MacBook Pro’s introduction set a new standard for laptop displays and did away with the DVD drive, not much has changed in the way of your standard laptop — especially for Apple. Four years before that, Apple simply moved to the now-ubiquitous unibody design. But after well over a year since the last refresh, Apple is back with a generational update that millions have not-so-patiently awaited. It’s about time. Let’s jump right in with the newest features of the latest Apple MacBook Pro range. 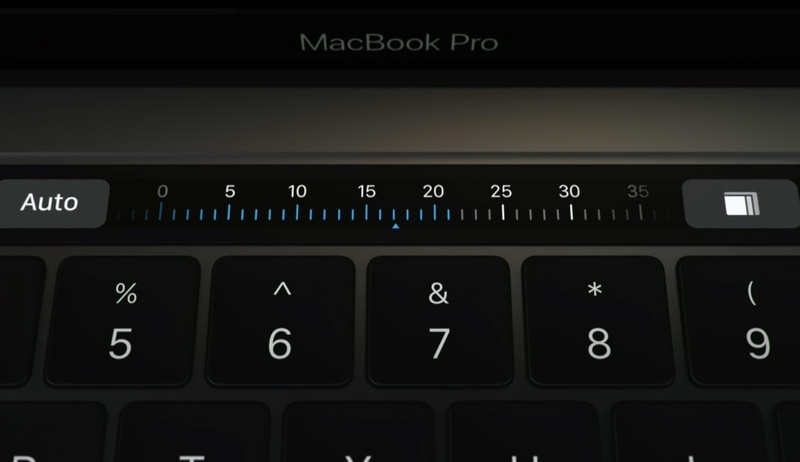 The latest Apple MacBook's most discussed feature is the Touch Bar. The Touch Bar takes the place of the entire row of function keys and instead presents users with a single, keyboard-length touch-sensitive OLED display strip. This screen of sorts adapts its uses depending on the application or task at hand. Text and iconography on the keyboard is application-specific, and touching various areas of the Touch Bar can perform a variety of tasks. At the far right of the Touch Bar is an area for Apple’s Touch ID fingerprint-recognition technology used in its phones and only now included in the latest MacBook models. Touch ID can be used for a variety of functions, including for Apple Pay in Safari on Apple’s latest MacOS Sierra operating system. Just as Touch ID has expanded as banking (and other) apps have been able to take advantage of it for sign-ins, expect Touch ID to become a more integral part of the Mac experience in the future. Of course, everyone will enjoy the new, slimmed down, lighter form factor of Apple’s new MacBook Pros. 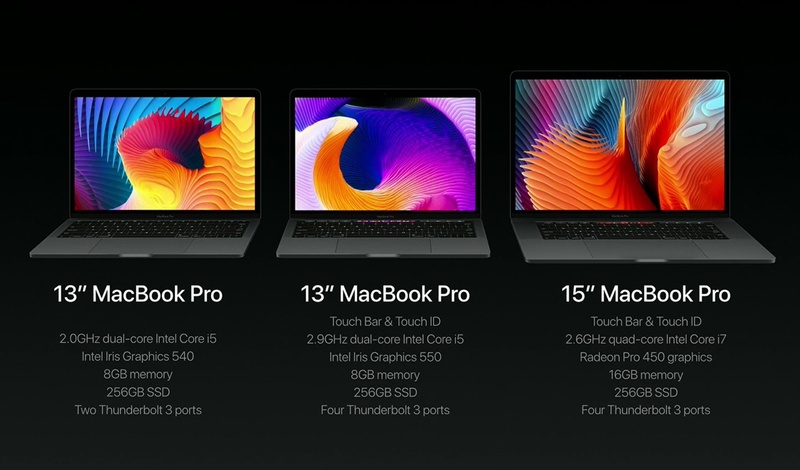 The new MacBook lineup includes a 13-inch MacBook (based on the design of the original 12-inch MacBook) and a MacBook Pro in 13-inch and 15-inch variants. 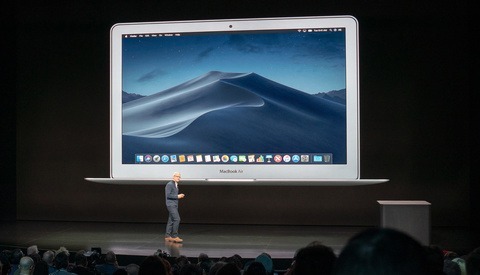 The MacBook Air is no longer, as the new MacBooks are about as thin as one would ever need a computer to be. The 13-inch MacBook Pro weighs three pounds and is 14.9 mm thin, over 15-percent lighter and 17-percent thinner than the outgoing MacBook Pro. The 15-inch MacBook Pro features similar portability gains. The other visible difference is a larger trackpad that truly qualifies as massive. 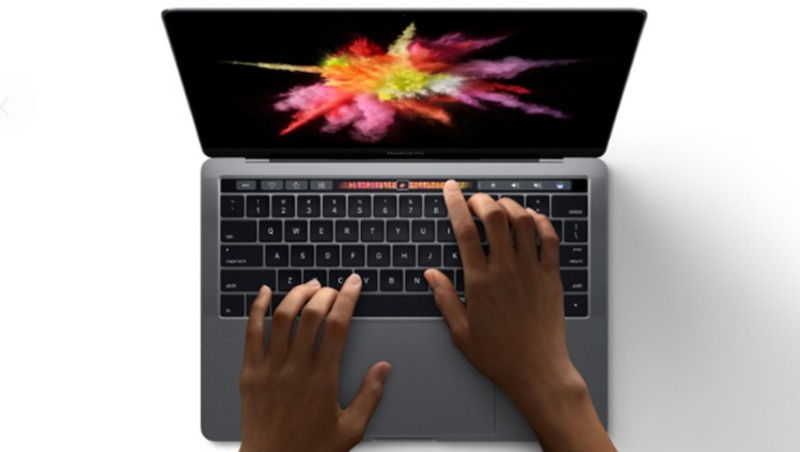 It's double the size of the previous trackpad and complements a thinner keyboard borrowed, but also improved, from the 12-inch MacBook using the "butterfly" key mechanism. We also get a color choice for the first time in the MacBook Pro line-up, silver and space gray. Apple continues to lead the way in innovating traditional connectivity to our technology, and this time the MacBook Pro gets the treatment. 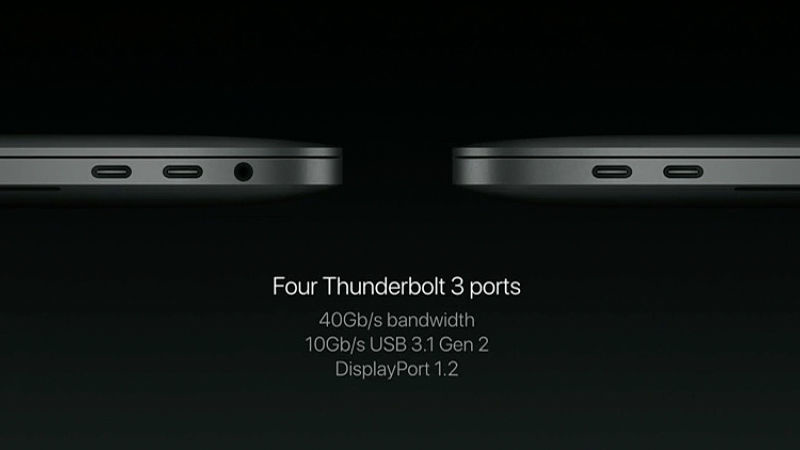 There will now be four USB-C Thunderbolt 3 ports in replace of the HDMI, MagSafe, Thunderbolt, and USB ports. This means you can charge with any of the four ports, plug a display into any of them, and so on. It also means you will need a lot of adapters as not much plugs directly into USB-C ports right now. I get the feeling that this will seem irrelevant in a few years time as we all adapt to the new connectivity of the MacBook Pro, but upgrading now could cause all sorts of headaches to an existing multi-peripheral setup. We get a bump in the quality of the already impressive Retina display. The new MacBook Pro screens will be 67 percent brighter, have 67 percent higher contrast ratio, 25 percent more colors, and operate on less power than the previous model. The other headline-grabbing nugget that photographers will be interested in was the ability to daisy chain two LG UltraFine 5K a single USB-C port that will also charge your MacBook Pro. 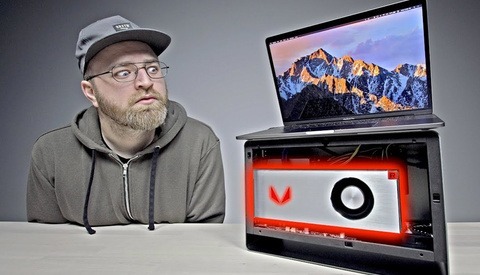 Under the hood, the 15-inch model is powered by a quad-core Intel i7 processor, 2,133Mhz RAM, and Radeon Pro (Polaris) graphics, which is 2.3-times faster than before and can hold up to 4 GB of video memory. The 13-inch version will include dual-core i5 and i7 processors and Intel Iris Pro graphics, which Apple claims is twice as fast as the last model. Video editing was cited in the keynote to be 57 percent faster than the old models. Battery life is up to 10 hours. Whilst there are notable power, screen, and form factor upgrades, it will be the new Touch Bar that will undoubtedly lead the way in terms of headlines, and rightly so. Apple is offering a new way to reach common tasks in apps without the need to remember keyboard shortcuts. Whilst the integration into Safari looks slick, power users of photo editing software such as Adobe Lightroom will already have keyboard shortcuts assigned to muscle memory, so the new Touch Bar may not feel like such an appeal to upgrade. As Apple have shown in the past, upgrading isn't as simple as replacing one machine for another, rather you must ensure all peripheral devices can now speak Thunderbolt 3 via what is likely to be a multitude of adapters. So is this the MacBook Pro that photographers have been waiting for? Well it certainly depends on the machine you're running now. Power gains will likely feel marginal against the mid-2015 Intel i7 Quad-core version but significant against older versions. The Touch Bar could be a revolution for workflow, but then again, I'm not quite sure if there was the demand for something like this to begin with. And then there is the headache of everything you currently plug into your MacBook Pro not fitting any longer. 13-inch MacBook Pro without Touch Bar and Touch ID, 2 GHz Intel Core i5 dual-core processor, Intel Iris Graphics 540, 8 GB RAM, 256 GB SSD, 2x Thunderbolt 3. Available today for $1,499. 13-inch MacBook Pro with Touch Bar and Touch ID, 2.9 GHz Intel Core i5 dual-core processor, Intel Iris Graphics 550, 8 GB RAM, 256 GB SSD, 4x Thunderbolt 3. Shipping in two to three weeks from $1,799. 15-inch MacBook Pro with Touch Bar and Touch ID, 2.6 GHz Intel Core i7 quad-core processor, AMD Radeon Pro 450 Graphics, 16 GB RAM, 256 GB SSD, 4x Thunderbolt 3. Shipping in two to three weeks from $2,399. Will you be upgrading, and how well do you see the Touch Bar being incorporated into your current workflow? No story on the Surface Studio? I question that, too. Apple's specs just seem like newer specs... while Microsoft's Surface Studio pulled me in with it's entire concept. Like a double punch at both Apple and Wacom's massive (clunky) Cintiq. Sorry, we were a bit late on that but it's up now. There was also a new top end SurfaceBook announced with better slightly better specs and 16 hour battery life. Yayy our voices have been heard lol. Sure the Touch Bar is a cool idea... But can it handle editing 8k footage natively without proxies? A Mac "Pro" with 256Gig SSD as the default for every model? well, you can upgrade to 2TB for a price of a kidney. Crazy price for crazy specs (in a bad way). Whoever had the idea for a "pro" computer that needs an adapter for 99% of devices on the market should be fired. I really think this is the beginning of the end of Apple in the laptop market, that's a product that simply doesn't make sense. The amount of time spent going over the LG 5K displays they worked in partnership on seemed strange. I think that about confirms an updated thunderbolt display isn't happening. But first I'll buy an "old" MacBook with useable interfaces. Just as a backup. Wow. Bold move losing USB and HDMI but ill-conceived, I think. Working pros need ports for hard drives, connections to external displays for presentations, mobile studios, etc. Who wants to add an army of adapters to their kit? I get being future savvy, but I need a workhorse that meets my needs today, not 5 years from now. Did they release a thunderbolt 3 to SD Card reader adapter? thunderbolt 3 to USB3 and Thunderbolt 3 to HDMI adapter? Without those tools working pros rely on, they might as well call it the MacBook. Instead of a touch screen, they give you a touch bar and change you the same price. Brilliant! sigh... why remove the SD card slot? that's the something i use almost daily to import photographs.. I don't want to have adapters which i most definitely will lose.. I get that apple wants to innovate, but give people some time to make the transition to new way's of data transfer.. They're basically forcing you to buy new compatible hardware for this laptop or force you to use adapters which everyone hates rightfully.. I don't want to spend my money on an iMac with a year old hardware for the same price they charged it for a year ago.. I really like apple but my first reaction to the news of no iMac update was to see what kind of PC i could put together instead of a € 4500,- iMac setup.. But i'm just not ready to go back to windows yet, so please apple do something... It's not that i don't like the specs of the current iMac, it's just that i don't want to pay that kind of money for it.. I was also really hoping for an iMac announcement but it looks as if I will be going with the surface studio. 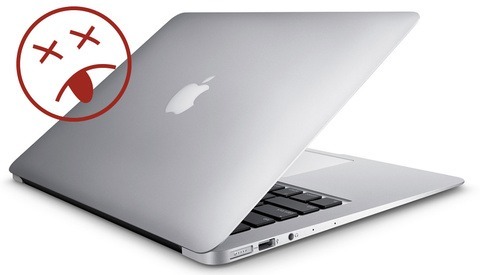 Still might get the MBP instead but am also bummed about the SD card slot. I do think that it's cool that you can draw on the force pad though. That would be helpful for editing photographs. I'm so confused. HDMI is a must, same with SD slot. Adapters are jenky and just another thing to pack and keep track of and ultimately be without when needed most. A traveling pro who lives 40% in hotels needs HDMI to watch Game of Thrones and Jessica Jones properly! 4 years? For this? A bit faster, a bit thinner, a bit longer battery, and a shiny new tool bar that mostly does what the old tool bar did. Big whoop. And hey let's also ditch all the ports the pros use. WTF? It seems innovation at Apple died with Jobs. They should see if they can hire Elon Musk. Does anyone remember how much the base 15" model used to be? I think it was somewhere around $1700. The new one starts at $2400. So a $700 increase for less connectivity options, no magsafe charger, and some gimmicky touch bar. No thanks. Luckily I (hopefully) won't need a new computer for a couple years, but when the time comes, I might be ending my 15+ year run with Apple. As a guy that is fully immersed in the Apple ecosystem...they really keep dropping the ball on these things. Microsoft is on the right track by releasing full OS on a touch platform. I'll upgrade when Apple releases a touch Mac that I can draw on and....basically the Apple version of the Surface Studio. As for then...Microsoft is, and will be, leagues ahead. Apple needs to go back to their drawing board and relaunch this thing! Epic fail!!!! Instead of allowing pro users to reduce workflow they added complexity, and of course, the emoji!! As a nearly 10yr Apple user I will be upgrading to Microsoft for the first time. The new Razer Blade Pro is far more promising. And even their 14" option is still better than the new Mac Book Pro. It's all "Apple" branding, gimicks, and removal of "unnecessary" like the function keys. The touch bar isn't bad idea, but why Apple can't just put the bar on top of the function keys by reducing the size a bit of that track pad. I'm honestly curious why Apple users are against touchscreen laptops/computers. I don't mind the touch bar concept, but scrubbing, zooming, rotating and... (groan) emoji! Could be equally as efficient as a welll placed on-screen touch toolbar. Looking down to the keyboard just doesn't seem comfortable or faster than using a mouse/trackpad gesture or actually "touching" the project. Core i5 with a 256GB SSD for FIFTEEN HUNDRED DOLLARS? Are they even trying anymore? My laptop has an i7, 16GB ram, a terabyte of storage(granted, non-ssd, but still... this is a "PRO" macbook), GTX 960M, purchased for just about a thousand dollars.